In 2010, the global economic recovery continued after exiting from the sharpest post-war economic contraction in the second half of 2009. This was led by strong economic activity in the emerging market economies such as China and India which posted a 10.3% and 8.6% GDP growth rate respectively in 2010. In the United States, real GDP expanded by 2.8% while the Japanese economy rebounded strongly by 3.9% in 2010. In the euro zone, real GDP expanded modestly by 1.7% largely due to the strong export-led growth in the core economies, in particular Germany. The Malaysian economy experienced a strong resumption of growth in 2010, recording an expansion of 7.2% following the downturn in 2009. The Malaysian timber sector played a significant role in the country's economy contributing 3.7% of the GDP and 3.2% of the country's total merchandise exports. In 2010, exports of Malaysian timber and timber products registered a positive growth of 5.3% with total exports of RM20.5 billion compared with RM 19.5 billion in 2009. The surge of exports was attributed to the positive performance of all sub-sectors except for Builders' Carpentry & Joinery (BCJ). Wooden furniture remained as the biggest export item which contributed 31.8% of total timber exports in 2010 amounting to RM6.5 billion. This was followed by plywood and sawntimber which accounted for 25.1% and 12.4% of total timber exports respectively. In 2010, both MDF and particleboard made impressive progress with export growth of 16.3% and 15.4% respectively compared to the previous year. Asia accounted for 62.5% of Malaysia's total timber exports in 2010 followed by the Americas at 15.8% and European Union (EU) at 14.1%. In the Asian region, growth was exceptionally strong in the first half of the year driven by robust domestic demand. Malaysia's total timber exports to South Asia, Central Asia and ASEAN regions registered double-digit growth of 12.6%, 15.9% and 12.2% respectively in 2010 over the previous year. Japan, USA and India remained as the top three export markets for Malaysia's timber products. In 2010, 18.3% of Malaysia's total timber exports valued at RM3.8 billion went to Japan, recording a marginal increase of 0.8% compared to 2009. Ranked second was USA, contributing 12.6% to Malaysia's total timber export earnings. India, the third biggest timber export destination with a market share of 7.3%, chalked up a 12.7% increase in imports from Malaysia. Trailing closely behind India was Taiwan with imports of RM1.1 billion, registering an impressive 31.4% increase. Logs, the fourth largest export item, contributed 10.4% of Malaysia's total timber exports in 2010. The total export of logs increased by 6% to RM2.1 billion and 4.1% in volume to 4,335,454 m3 over the previous year. 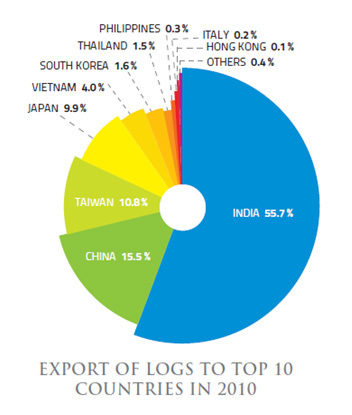 India remained as the largest market for Malaysian logs since 2005. The country accounted for 55.7% of Malaysia's total log exports in 2010. Exports to India grew by 7.5% to RM1.2 billion mainly due to the continuing construction boom in its commercial and residential sectors. The Indian construction sector grew 8.8% in the second quarter of the fiscal year 2010-2011 compared to the same period in previous year. A similar upward trend was also apparent in Malaysia's traditional log export markets in the Far East namely China, Taiwan and Japan. China, being the second largest market for Malaysian logs, imported RM332.3 million worth of logs, an increase of 7.6% over the previous year. Taiwan's and Japan's uptake of Malaysian logs recorded a remarkable growth of 15.8% and 24.2% over the previous year. Malaysia's sawntimber sector showed an improved performance in 2010 both in volume and value terms by 14.6% to 2,177,526 m3 and by 8.1% to RM2.5 billion respectively as compared to the previous year. 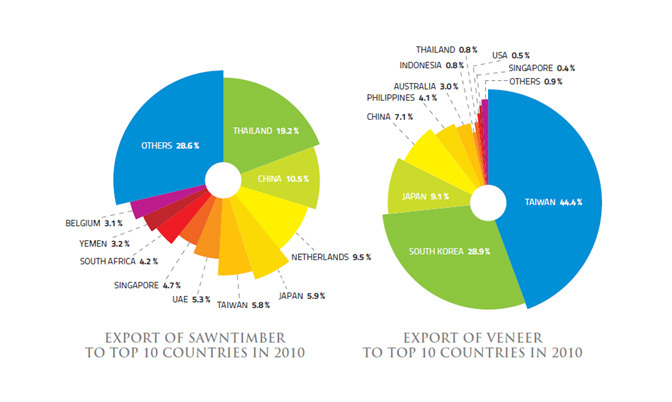 Sawntimber was the third largest export item, contributing 12.4% of Malaysia's total timber exports. Thailand continued to be Malaysia's top importer of sawntimber. Shipments of sawntimber to Thailand recorded a tremendous growth of 35.5% in volume to 623,289 m3 and 23.6% in value to RM487.3 million in 2010. This robust growth was largely due to the Thai real estate sector which has performed well despite the political turmoil in the second quarter of 2010. The booming property sector was driven by government tax incentives and a change in developers' strategies to build smaller and affordable units. The condominium sector has grown to be the largest real estate segment in Thailand, with steady price growth in the Bangkok metropolitan area and exponential growth in resort destinations. China overtook the Netherlands to emerge as the second largest buyer of Malaysian sawntimber in 2010. China imported a total volume of 231,504 m3 valued at RM266.7 million, registering an impressive growth of 40.3% in terms of volume and 45.3% by value. This positive growth was propelled by the Chinese construction sector which picked up pace last year owing to the strengthening of its economy and the government stimulus package. In addition, an increase in the Chinese wood manufacturing sector also contributed to a jump in demand for sawntimber. The Netherlands was the third leading buyer of Malaysian sawntimber, imported 88,846 m3 of sawntimber from Malaysia valued at RM239.9 million, a drop of 5.7% and 5.9% respectively. Although the Dutch economy has picked up gradually in 2010, the construction sector performed badly with turnover in the construction sector slumping even more in 2010 than in 2009. 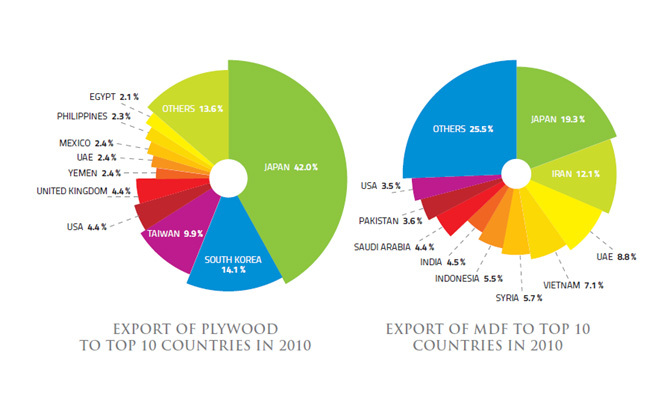 Plywood is the second largest export item and accounted for 25.1% of Malaysia's total timber exports in 2010. Export of plywood strengthened in value terms by 3.2% to RM5.1 billion however export volume decreased by 3.3% to 3,723,673 m3. This was attributed to the rebound of plywood prices from its low in 2009. Japan remained as the largest market for Malaysian plywood, contributing 42% of Malaysian plywood exports last year. Shipments to Japan fell 3.2% in volume to 1,437,070 m3. However value increased by 6.8% to RM2.2 billion in 2010. Demand for plywood products from Japan continued to dwindle due to weak housing starts. Buyers have been unwilling to commit as they adopt a very cautious approach due to economic uncertainty. In 2009, Japan housing starts plunged to a record low of less than 800,000 units, the lowest ever recorded in the last 45 years. Despite various measures undertaken by the Japanese government to stimulate the housing sector, total housing starts only recorded a marginal increase of 3.1% in 2010 compared to the previous year. South Korea accounted for 14.1% of exports of Malaysian plywood and was the second biggest plywood market for Malaysia in 2010. Import volume of 640,409 m3 valued at RM727.7 million were recorded. This represented a drop both in volume and value by 8.3% and 5.4% respectively compared to 2009. Trailing behind was Taiwan which ranked as the third largest importer of Malaysian plywood in 2010. Exports to Taiwan recorded an impressive growth of 23.9% in volume to 406,469 m3 and 30.7% in value at RM512.2 million compared to the previous year. Malaysia's veneer sector recorded a positive growth in 2010 with exports firming up by 9% to 306,783 m3 in volume and in value by 9.9% to RM338.1 million compared to the previous year. It accounted for 1.6% of the country's total timber exports in 2010. The top four markets for Malaysia's veneer were all in the Far East region namely Taiwan, South Korea, Japan and China which together accounted for 89.5% to Malaysia's total veneer exports in 2010. In 2010, Taiwan superseded South Korea to re-emerge as the largest importer of Malaysian veneer. Exports to Taiwan registered a notable growth of 52.6% in volume to 143,710 m3 and 47.7% in value to RM150 million compared to the previous year. Malaysia's exports of veneer to both South Korea and Japan continued its downward trend with exports dropping by 9.4% to RM97.8 million and 3.9% to RM30.8 million respectively in 2010 compared to the previous year. However, China's uptake of veneer recorded a surge of 34.3% to RM24 million. 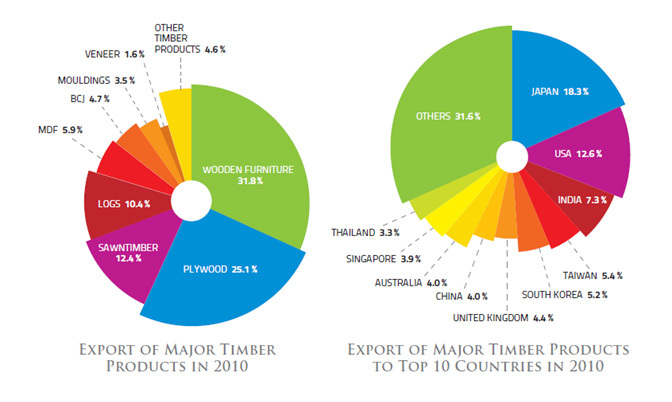 Export of Medium Density Fiberboard (MDF) contributed to 5.9% of Malaysia's total timber exports in 2010. Export volume grew by 19.4% to 1,236,653 m3 while export receipts increased by 16.3% to RM1.2 billion as compared to the previous year. Japan continued to be Malaysia's top importer of MDF with an import value of RM232.1 million, an increase of 15.6% compared to 2009. In volume terms, Japan's import of Malaysian MDF increased by 10.8% to 152,645 m3 compared to the previous year. Iran has emerged as the second largest market for Malaysia's MDF in 2010, overtaking UAE and Vietnam with a whopping growth of 200.1% to 134,765 m3 and 63.7% in value to RM145.4 million respectively. UAE as the third largest buyer of Malaysian MDF took up 8.9% of Malaysia's total MDF exports. Export of Malaysian MDF to UAE amounted to RM105.3 million, a decrease of 10% compared to the previous year. In 2010, India recorded its highest-ever import of MDF from Malaysia valued at RM54.6 million, a hike of 108.4% compared to 2009. The high demand for MDF was attributed to the booming housing construction and furniture manufacturing sectors in India. Other emerging markets namely Pakistan, Saudi Arabia, Jordan and Lebanon had also shown double digit growth in 2010. The mouldings sector accounted for 3.5% of Malaysia's total timber exports last year. The sector registered a total export of RM715.9 million, up 4.3% while export volume increased by 10.5% to 283,874 m3 compared to the previous year. The Netherlands retained its position as the largest importer of Malaysian mouldings. 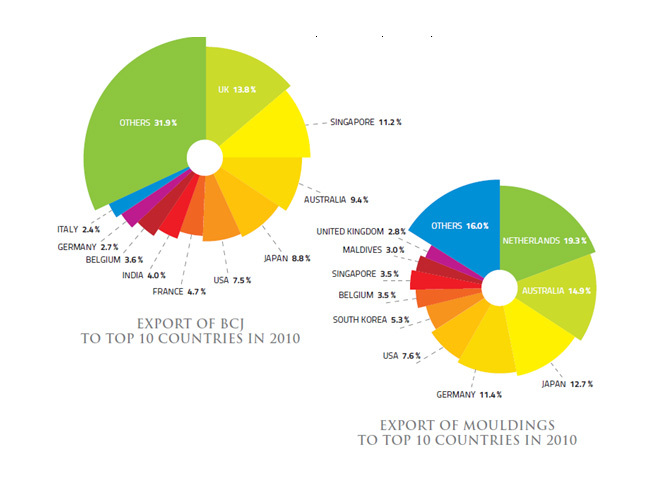 The country accounted for 19.3% of Malaysia's total mouldings exports in 2010. Malaysia exported 49,006 m3 of mouldings worth RM137.9 million to the Netherlands, a significant growth of 40.9% in volume and 20.4% in value compared to the previous year. The Dutch mouldings sector showed a stable growth in 2010 attributed by home improvement, refurbishment and DIY sectors. There was an increased demand for foil and real wood-veneered mouldings and fully-finished white prime mouldings in the Netherlands and other European countries. Australia climbed up the rank to become the second largest importer of Malaysian mouldings, with total imports amounting to RM106.7 million, a marginal increase of 1.5% year to year. Falling into third position was Japan. However, shipments of mouldings to Japan saw a drop of 6.7% in volume to 35,757 m3 and 15.3% in value to RM91 million as compared to the previous year. Export of Builders' Carpentry and Joinery (BCJ) registered a decline of 3.3% to RM954.7 million in 2010. It contributed 4.7% to overall export earnings of Malaysia's timber products. UK overtook Japan to emerge as the leading importer of BCJ in 2010 while Japan slipped to fourth place. Exports to the UK registered an increase of 13.9% to RM131.8 million compared to the previous year. In 2010, UK's real GDP expanded by 1.3% but growth was mainly contributed by inventory restocking while domestic demand continued to remain subdued. The joinery sector in the UK was generally better than expected as house building activity is showing some recovery after a boost from commercial and civil engineering projects. Trailing behind the UK were Singapore and Australia which imported RM106.7 million and RM89.4 million worth of BCJ respectively from Malaysia. Exports of BCJ from Malaysia to Japan fell 36.3% to RM84.4 million in 2010 compared to the previous year. USA which used to be the leading importer of Malaysian BCJ continued its downward trend with a decline of 9.5% to RM71.4 million. The wooden furniture sector performed creditably in 2010 with export receipts topping all other timber products accounting for 31.8% of Malaysia's total timber exports. 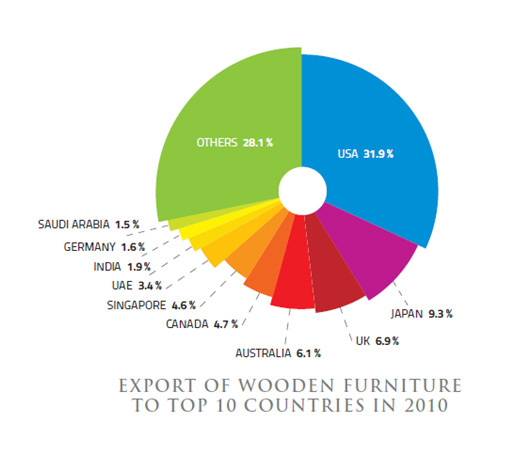 Total exports of wooden furniture by Malaysia surged 4.4% to RM6.5 billion in 2010. By far, the USA continued to be the largest single market for Malaysian wooden furniture, accounting for 31.9% of Malaysia's total wooden furniture exports in 2010. Exports to USA increased by 7.3% to RM2.1 billion compared to the previous year. USA remained the largest furniture consumer and importer worldwide, accounting for about one quarter of total world furniture consumption. In 2010, US furniture and bedding sales expanded by 2.9% compared to the previous year. Japan remained as the second largest buyer of wooden furniture accounting for 9.3% of total Malaysia's exports. However, exports to Japan fell by 14.6% to RM607.5 million in 2010 compared to the previous year. Malaysian wooden furniture exports to UK, the third largest market dropped 11.2% to RM451.8 million. Canada has emerged as an important market for Malaysian wooden furniture with exports registering an impressive growth of 27.7% to RM303.5 million in 2010. The country ranked as the fifth largest export destination for Malaysian furniture. In recent years the rapid growth of imports and the decline in exports have turned Canada into a net importer of furniture. India, ranked eighth for Malaysian wooden furniture exports in 2010, registered an impressive growth of 32.1% to RM124.2 million, the largest increase amongst the top ten importing countries. Although the Indian market is dominated by locally manufactured furniture, there is an increasing trend of preference for imported furniture in affluent households. Overall the Malaysian timber exporting sector will continue to face various challenges in the near future with the weakening US dollar against the Ringgit, unpredictability in freight services and charges and continuing difficult economic conditions in major markets like the European Union and USA. It is expected that exports of timber products to Western Europe and USA will generally continue to experience slow to moderate growth due to the underlying uncertainty in the financial and building construction sectors in the two regions. The current political uncertainty in many countries in the Middle East is also likely to have a negative impact on Malaysia's timber exports to the region. On the other hand, a surge in demand for timber products is expected by Japan for reconstruction purpose after the devastating Tsunami in March 2011. Demand for timber products in general is also expected to remain robust in the Asian region especially in countries like China and India.